With the opening of the shopping center "Las Arenas" Barcelona has gained a new attraction. Spread over six floors there are 115 shops, a fitness center, a 12-screen cinema, an event hall and several bars and restaurants within the beautifully restored facade of a former bullring. The view from the roof top is especially nice: You have a 360 ° -view over the city and the Montjuïc. You will find countless restaurants up there, from which you can eat comfortably while looking over the rooftops of Barcelona. Today, Las Arenas is mostly a shopping and leisure palace whose extraordinary architecture makes it very worth seeing. Las Arenas is located directly on Plaça Espanya, where Avinguda del Paral·lel, Gran Via de les Corts Catalanes, c / Tarragona and c / Sants meet. 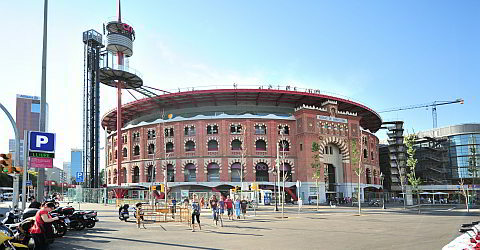 From Las Arenas you can also get to two metro lines and several trains of the Catalan Railway. From here you can set off for the nearby Montjuïc. The local mountain of Barcelona offers many attractions: Font Màcica, National Museum of Art of Catalunya (MNAC), Pavillon Mies van der Rohe, Miró Museum and the Castell de Montjuïc. On the northern side you will find the Parc de Joan Miró. The converted Las Arenas was inaugurated in March 2011. The building was designed by the British architect Richard Rogers in collaboration with Alonso Balaguer. From the outside you can see the original purpose of the building: Las Arenas was one of three bullfighting arenas in Barcelona. The bullring was opened in 1900. The architect was Augusto Font i Carreras, who also finished the facade of the Cathedral of Barcelona. The bullring was one of his most important buildings. Bullfighting was never a Barcelona affair. It was more frowned upon for political reasons than cultural ones and was long regarded as the "sport" of the Castilian oppressors of the Franco era. One year after Franco's death in 1977, the last bullfight took place in the arena. The neo-Mudejar style building (see box on the right) was then left alone for many years. Trees grew on the inside, and all sorts of shady figures lingered in the slowly decaying building. According to Richard Rogers, it would have been easier to tear down the walls and build a new building in its place. However, the arena was a historically important site, in which at least the facade should be preserved. The rather thin facade was supported, the building gutted and then the complete circular facade raised several meters. It almost seems as if it is floating above the street. Inside, a modern and bright interior was created from a construction of steel, glass and brick. The beginning and the course of the reconstruction was documented and is exhibited on the 3rd floor (cinema level). You will see the illustration of the construction start and progress as well as completion and inauguration. The lower three shopping levels and the cinema level form their own structure in Las Areneas, organized around a huge atrium. The two upper levels and the roof terrace tower are above the historic facade. You can stay for a long time at the shopping center Las Arenas without getting bored. On three floors you can go shopping with a wide range from clothing and shoes to high-quality food. In between you can go to the cinema with 12 auditoriums. In the cinema they show current movies that are syncronized in Spanish. They show the movies only rarely in their original languages. In the evening you can go to one of the restaurants or bars on the roof and enjoy the view. A state-of-the-art fitness center with extensive spa services is also available at Las Arenas. The track, wich goes 360 ° around the building is verry impressive. While running on it you can enjoy a great view over Barcelona. - The shops and restaurants are open on all four Sundays before Christmas. Mudéjars were Muslims, that were still allowed to practice their religion after the expulsion of the Moors when the Spanish kings took over the leadership. The Mudéjars were working in the agriculture, did handicrafts and had a great influence on the architecture. The Mudéjar style began in the 12th century and had it\'s heyday in the 14th century. In the progress Islamic archtitecture was mixed with the archtitecture of the Romantic period, the Gothic and the Renaissance. The rediscovery of the Mudéjar on the Iberian Peninsula in the 19th century and the first 30 years of the 20th century is referred to as Neo-Mudéjar. It was popular to apply the Neo-Mudéjar style in the bullrings, as it is the case with Las Arenas. The Arc de Triomf, built for the world exhibition in 1888, is another example of the Neo-Mudéjar style.